When planning your wedding, one of the biggest decisions, and often the most expensive one, is the wedding venue. It has to have all the right elements to make your event spectacular. Everything from the right size to the right location has to meet your strict criteria. It’s a dizzying exercise. Do you want something with a view? Something with lots of free parking? Perhaps something remote and intimate? How does one choose? Well, luckily,in Vancouver, we have an abundance of great locations, from hotels to community centres and everything in between. Hotel ballrooms are always well adorned and they vary in size but are often quite expensive. Community centres are always very affordable but lack in background decor and comfort, leading to an additional expense in added decor. What is a good median location that offers both decor, comfort and affordability? What about a country club? We definitely have lots of those in the Lower Mainland. Golf and country clubs are in abundance in Vancouver with lush grounds, great views and loads of free parking. As a wedding venue, golf clubs are a perfect choice. They can be intimate or grand and always offer a balance between nature and urban scapes. I have many favourites, including Riverway Golf Club in Burnaby, and Northview Golf Club in Surrey. 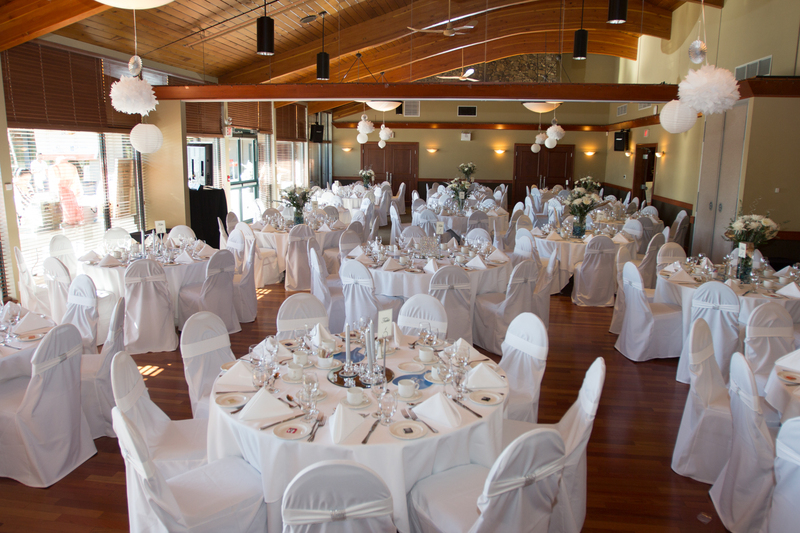 However, my overall favourite golf club for a wedding venue is the Vancouver Golf Club, that is actually located just outside the city in the suburb of Coquitlam. It was recently voted one of Vancouver’s Top Golf Wedding venues (along with Northview Golf and Country Club) and for good reason. Its tree lined curved roadway leads guest to the clubhouse and instantly sets the tone for romance. Once inside, the rich wood tones of the entrance calls to mind a time where quality was not only admired but expected. The ballroom sees past its large outdoor patio, across the trees to the city skyline in the distance. On a sunny day, the view is breathtaking! Whether your plans are grandiose and extravagant or simple yet elegant, Vancouver has something to suit your style. Narrow down the must have items on your wedding venue list and choose accordingly. You should be able to tick all the boxes without compromise in this great big city of ours! High back chair covers are perfect for dining room chairs or chairs that many Chinese restaurants use. This event features white high back chair covers with pewter taffeta sashes tied in an ascot tie style at Gingeri Chinese Cuisine in Richmond, BC. Vancouver brides, listen up! It’s bridal show season again and Dreamgroup Productions, one of vancouvers premier wedding planning companies, is at it again. 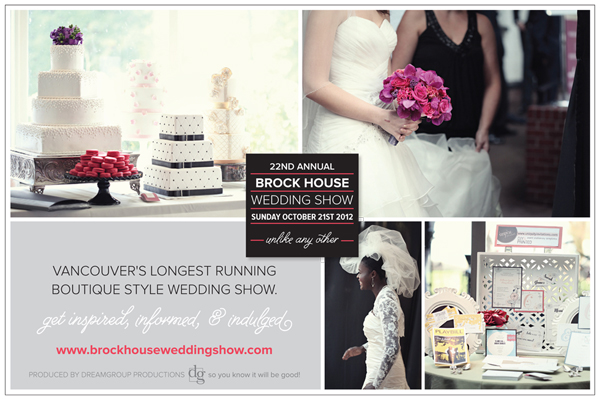 On October 21, 2012, the dynamic wedding planning duo will host a wonderful, boutique bridal show experience for local brides at a popular Vancouver wedding venue, the Brock House. Carefully selected vendors will be on hand to help “inspire” future brides in a relaxed and “unrushed” atmosphere. Everything a bride needs to envision her upcoming wedding will be presented at the show from flowers and decor to food and even a fashion show featuring tuxedos, bridesmaids and wedding dresses that are actually available in Vancouver! With the fabulous backdrop of Vancouver’s breathtaking Jericho Beach, this show truly showcases how a wedding can look, feel and even taste. So, don’t miss your opportunity to take in a wonderful day of wedding fun! Italian ceramics importer Giardini di Sole announces “La Vita è un Viaggio” (Life is a Journey), a unique bridal contest celebrating everyone’s favorite four-letter word. “What makes this contest so special is that we’re commemorating more than romantic love; we’re looking for brides who have taken their hearts on a variety of journeys and discovered unexpected places within themselves, their relationships, in nature or in a new city or country. · What aspects of your personal journey have shaped you into the woman you are today? · What aspects of your romantic journey with your fiancé made you know he was The One? · What travel journey impacted you most/helped bring something new out in you? First/Grand Prize: 8-person place setting of Cassandra Lemon design with serving pieces, and an Arcobaleno or Artistico table of choice. Visit http://www.giardinidisole.com for more info on their products. Thanks to The Whole Enchilada PR for all the info…Good luck to all! What to do about mom? One of the most often heard dilemmas in wedding planning is what should the moms wear? Do you have them wear long or short dresses? What colour should they wear and should the two moms coordinate so that one doesn’t upstage the other? Well, the answers to these questions are simple but not necessarily set in stone; so, use these tips as guidelines when looking for mother of the bride dresses in Vancouver (or mother of the groom) or anywhere else for that matter. The colour mom wears should compliment the overall theme of the wedding and it should go well with the bridesmaid’s dresses. Etiquette tells us the mother of the bride chooses her colour before the mother of the groom and that the ladies outfits should compliment each other. Both moms should not clash with each other or with the bridesmaids. If a complimentary colour does not work with either mom, they should wear something neutral. Some basic and fabulous mother of the bride colour choices are lavender, blue, rose, silver, burgundy or beige. The style of the mother of the bride dress depends greatly on the style of the wedding. A formal evening affair would allow for a full length gown, whereas a lunchtime event or a cocktail party would be perfect for a short dress or two piece suit. In any case, the length of the mothers’ dresses should be knee length or longer. Do not wear white. Always let the bride stand out not blend. Do not wear black. It would appear you are either mourning or disapproving of the wedding. Do not wear very bold colours if this is out of the norm for you. It will end up making you look tacky. The final word on what the mother of the bride, or groom for that matter, will be wearing on the wedding day rests with the bride. The moms should consult with the bride along the way to get her input and to make sure that the dresses will ultimately work with the bride’s vision for her special day. Vancouver is no stranger to the wedding scene as it plays host to many fine bridal shows throughout the year. If you are a bride to be, you’ve probably already attended one or two yourself. But have you been to one like the upcoming Bridal Swap? This is definitely one you should put on your calendar because a new concept in wedding shows is about to hit this city and you don’t want to miss out. To celebrate the launch of Anna Elizabeth Cakes, Anna is offering complementary consultations and tastings for all 2011 weddings. As well, any order placed before March 31st will receive 10% off!